When you turn on the lights each morning, you have electricians to thank. These professionals keep homes, businesses, and industries powered with the electricity that’s essential to accomplishing everyday activities. They couldn’t make all of this possible without their tools and skills. So, what are those tools and skills that electricians have? Installation: During the construction of a new home, building, or factory, electricians come in to install electrical systems for power, lighting, communications, controls, and much more. They install electrical wiring and systems before the walls are constructed. What Are the Tools Used by an Electrician? The tools electricians use depends on the job he or she is performing. They typically use a variety of hand and power tools for installation, maintenance, and repair. When troubleshooting a problem, electricians rely on a handful of testing devices. Conduit Benders: Run and protect wiring. Wire Strippers: Cut wire and remove insulation from wire. Drills: Pull, twist, grip, or cut wire. Hammers: Nail on brackets of secure boxes. Fish Tape: Pull wire through metal or PVC conduit. Voltmeters: Checks voltages and confirms if circuits are live and how much electricity they’re carrying. Continuity Testers: Determine whether components carry electricity. 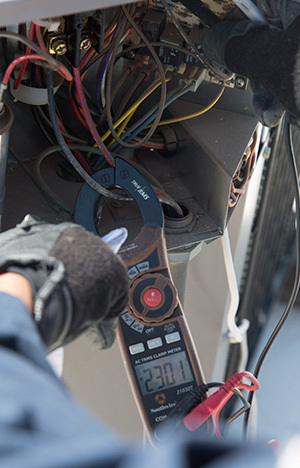 Electricians work in a range of different environments with a variety of tools. They often get their start in the trade with electrician training. In electrician classes students receive hands-on training with the tools of the trade and residential and commercial wiring. They also receive instruction in National Electric Code, which they’ll need to obtain their license and start working in the field after they graduate.